Bruce Bowen, a three-time NBA Champion to visit the Philippines, and celebrate the NBA Finals with Filipino fans, as announced by the National Basketball Association (NBA). 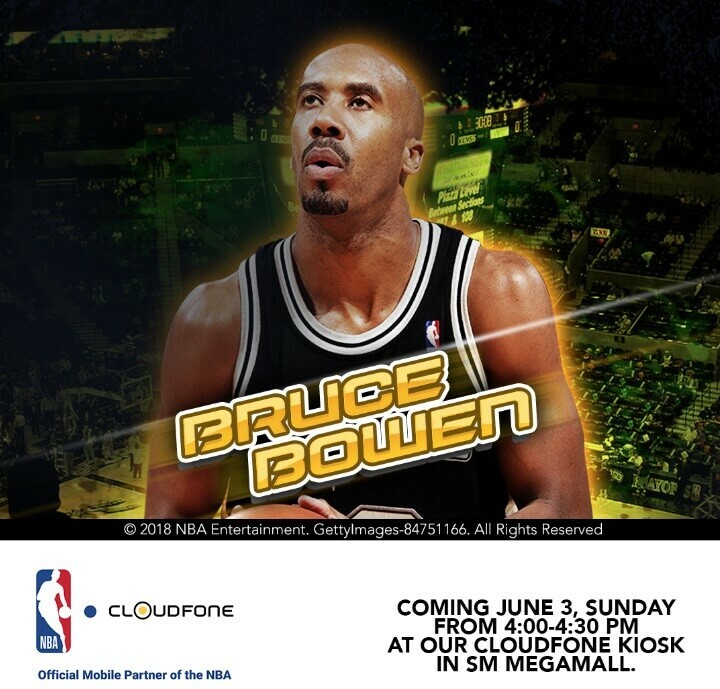 As the Official Mobile Partner of the NBA, CloudFone brings Bruce Bowen, the legendary NBA player from San Antonio Spurs, for a meet and greet this Sunday, June 3, 2018 from 4:00-4:30 PM at the Cloudfone Kiosk in SM Megamall. He will also attend two NBA Finals viewing parties on June 1 and 4, which will be hosted by Solar, an NBA broadcast partner for Games 1 and 2 at the Eastwood City Mall Activity Center and Buffalo Wild Wings in Glorietta 2, respectively. The 46-year-old professional basketball player is also expected to participate in NBA Cares community outreach efforts, that addresses social issues including education, health, and youth development. Bowen will also appear on #NBAStreamSquad on June 3, a digital show featuring local influencers that will preview the NBA Finals, at the Eastwood City Mall Activity Center, You may also catch him live via NBA Philippines Facebook page on the said date. Bowen, a 6’7” forward from California, made his NBA debut when he signed as an undrafted free agent by the Miami Heat in 1997. Afterward, he was selected to the NBA All-Defensive First Team from 2004-2008 and Second Team from 2001-2003. The 2018 NBA Finals is televised starting June 1 on ABS-CBN, S+A, Basketball TV and NBA Premium TV, and will also be available on NBA League Pass. For all the latest news and updates on the NBA, visit www.nba.com, download the NBA app and follow the NBA on Facebook (www.facebook.com/philsnba) and Twitter (www.twitter.com/nba_philippines).